If you park anywhere within FDR State Park (roadside or in parking areas) you must have a annual Georgia Park Pass or current daily use fee pass displayed. You can purchase a daily pass at the park office (The Park office takes cash and most debit and credit cards) or from cash only Self-Pay boxes located in the RV campground, (and as shown as SPB on the Pine Mountain Trail map) at the WJSP-TV Tower Parking Lot (Parking at the WJSP-TV tower parking lot is within FDR State Park), Rocky Point Parking Lot, Mollyhugger Hill Parking Lot, Dowdell's Knob Trailhead and near the FDR Statue in the picnic area at Dowdell Knob and Fox Den Cove Parking Lot. . The fee for regular size passenger vehicles and vans is $5.00 per day. A yearly pass available at the park office only is $50.00 for a vehicle (van/bus) up to 13 persons. For larger vans and buses fees, call the park office at 706-663-4858. SHUTTLES for HIKERS AND BACKPACKERS. NOTE: Hikers and backpackers, if a bad weather situation comes up or you are injured on hike, the park rangers may be able to pick you up at a trailhead to take you off the trail. Park Emergency numbers posted on the back of the trail map and on stickers posted all along the trails. Backcountry permits for the Pine Mountain Trail. Even if you have reservations, you still must go by the FDR State park office and fill out/receive your actual backcountry permit and they are issued only on the day you start out backpacking. If you don't have reservations you may call to see what is available, then you must come to the park office and see what is available at that time of the backcountry campsites which is thus "first come" basis for unreserved sites. Online site specific reservations can be made for the single fire-ring, single permit sites and only the "A" fire-ring of two fire ring sites. The "B" fire-rings of two fire ring sites may be available for those coming to the park office without reservations, or if an "A" is not reserved they may choose it. 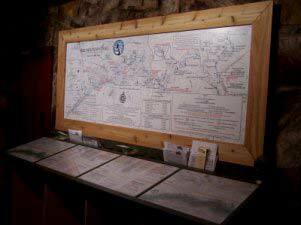 As you enter the park office, to the right is an area with a large trail map and blank backcountry permits. Review the map and pick out the campsite(s) where you'd like to stay if you don’t have reservation, then grab a permit and fill in your name, address and vehicle tag information only. You will need to do this even if you have reservations. Then go to the counter where the clerk or park manager on duty will tell you which backcountry sites are available or if you have site specific reservations they will help you fill in the rest of the permit including campsite and parking location (for trail entry and exit point.) You'll need the tag numbers of all vehicles you are using/driving and leaving at a trailhead to record on the backpacking permits. The individual Backcountry permit fee is $10.00 per night per person up to a group of 5. For a group/family or organization permit for 6 or more the fee is $50.00 per night. In addition to the backcountry permit, you will still need to purchase a one-time daily parking permit for every car parked on park property. Thus you will only have to pay for one permit (ie $5) for each vehicle regardless if you stay one night or several days. The Park takes cash and most debit and credit cards. Backcountry camping fees are waived for Pine Mountain Trail Association Members upon presentation of a valid, active in-date PMTA membership card. NOTE: the park does not have record of PMTA members, so the membership card is a must have. PMTA members can also make site specific online reservations, and hold- charge for reservation will be backed off their credit card upon arrival at the park office. Just fill out the permit and take to the clerk on duty, tell of your reservation and show your valid PMTA membership card. Park rules state that each site can have a certain number of persons/tents per site per night. See our SITE DESCRIPTIONS section on this website for how many each site will hold. NOTE: if you are a Scout unit and say have 25 boys, be prepared to split up into two sites if available (unless you choose NEW Turtle Hollow Campsite and it is available. ). Each vehicle left overnight anywhere within FDR State park must have a copy of the backcountry permit (blue copy) on the dash of the vehicle in plain view and a valid daily use fee parking permit or Georgia Park Pass. If you travel to FDR in two or more vehicles, ask the clerk at the park office for a duplicate of the copy of your backcountry permit for each additional vehicle. The white original copy of your backcountry permit is to be fastened to the backpack of the person who obtains the permit. Permits must be obtained about 2 hours before dark (this is so you get on the trail and hike to your campsite before dark). You must be 18 years old or older to obtain a backpacking permit, so there must be at least one person in the group 18 or older who actually goes backpacking and whose name is on the permit as responsible for the campsite. You must park where your backcountry permit says and use only the designated named backcountry campsites you have a permit for. Most parking areas are patrolled by both the FDR State Park Rangers and the local county sheriff. If your group wants to camp out together and not hike in to a backcountry site, the FDR State Park has a Pioneer Camping area away from the Pine Mountain Trail near the RV campground. This is a drive up primitive area. Some scout units use this area for their younger scouts and another leader or two take the older ones backpacking on the Pine Mountain Trail. Contact the FDR park office for fees to camp in the Pioneer area. This area is not part of the Pine Mountain Trail backcountry.